In 1969, NASA hired seven new astronauts. What's different about these seven than most NASA astronauts is that all of them already were astronauts before they were actually hired by NASA. That's not to say that they'd flown in space before: none of them had. However, all seven had already been trained as astronauts by the U.S. Air Force, as part of its military space program. The Air Force established a space program soon after it was created as a separate branch of the military in 1947. 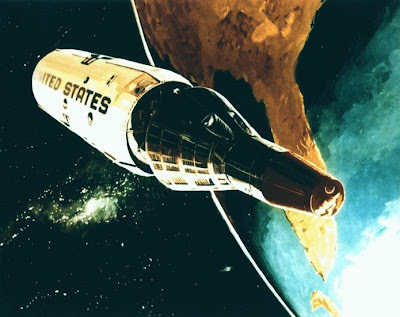 Throughout the 1960s, the Air Force hired 17 pilots from the Air Force, Marine, and Navy, intending to send them to a military space station, the Manned Orbiting Laboratory. 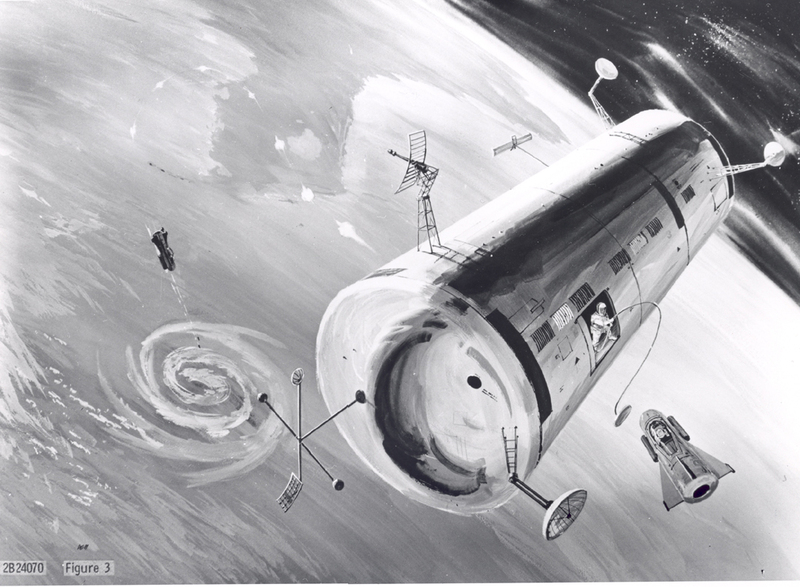 The planned Manned Orbiting Laboratory. The Manned Orbiting Laboratory would have been a surveillance platform and a temporary home for military astronauts who would spend their time watching and photographing the Earth below. But unmanned satellite technology pretty soon advanced to the point where it was just as effective (and much, much cheaper) than sending astronauts into orbit to photograph the Earth. So, in 1969, the Manned Orbiting Laboratory was cancelled, and 7 of the youngest of the 17 Air Force astronaut were hired as NASA astronauts. All 7 eventually flew on the space shuttle in the 1980s. Another view of the Manned Orbiting Laboratory. What happened to the other 10 Air Force astronauts at the end of the program? Most resumed work for the branch of the service they had originally worked for, with some flying combat missions in Vietnam and one former astronaut, James Abrahamson, advancing to the rank of general. One became a pilot for NASA. One went back to school for a master's degree. One died in a T-38 crash in 1970. But by the time the Manned Orbiting Laboratory program was cancelled, two of the 17 had already been killed in training accidents. It's a shockingly high number, though unfortunately not surprising, given that all 17 were military pilots, and many flew experimental aircraft. One of the 17, a test pilot named Major Michael Adams, died in a plane crash in 1967. 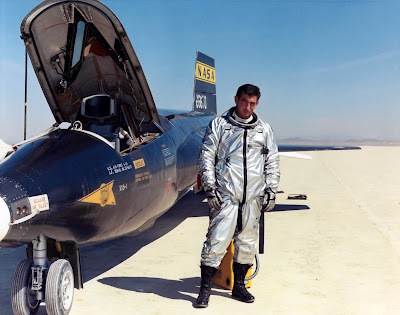 He took his X-15 over 50 miles above the Earth's surface. The Air Force considers 50+ miles to be outer space and awards astronaut wings to pilots who fly that high. Minutes later, travelling at over 3,400 miles per hour, Major Adams' X-15 went into the world's first "hypersonic spin." Amazingly, he was initially able to recover control over the craft, but at that point it was plummeting towards the ground, and it's believed that the g-forces caused him to loose consciousness. Thus he was unable to eject from the plane when the stress of the dive tore it apart. The other one of the 17, Major Robert Lawrence Jr., died in 1967 while serving as a flight instructor. The plane his trainee was flying crashed on landing. Major Lawrence's ejection seat malfunctioned, threw him out of the plane horizontally, and he died on impact. 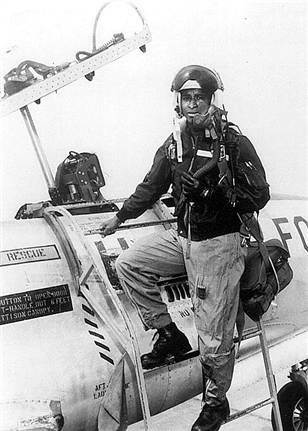 If he had lived to join the 1969 NASA astronaut class, Major Lawrence would have become NASA's first African-American astronaut. But instead, NASA did not hire any African-American astronauts until 1978, and Colonel Guion Bluford became the first African-American in space in 1983. 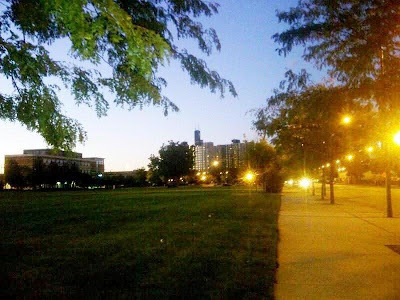 Major Lawrence was born and raised where I now live: on the South Side of Chicago! For any interested locals, his childhood home was on the corner of 23rd Street and South State Street. We drove over to that block the other evening. Back when Major Lawrence was born in the 1930s, it was working class, all townhouses and apartment buildings. By the time he died, the neighborhood had gone downhill and been turned into housing projects. But the projects have since been razed, and most of his block is now an empty field. South State Street and 23rd Street: the birthplace of an astronaut! In interviews a few weeks after his death, Major Lawrence's family shared their favorite memories of the deceased astronaut. Throughout his childhood, he loved playing chess and building model airplanes. He was musically gifted, and was once hit by a truck on his way to piano lessons, only to pick himself up, brush himself off, and make it to the lesson on time. Major Lawrence asked for the same Christmas present every year: a larger and more advanced chemistry set than he'd gotten the previous Christmas. In high school, Lawrence lettered in cross-country and track and field. He graduated early, at age 16. In college, he majored in Chemistry and joined the ROTC. After graduating, he served as a test pilot and instructor pilot, training both U.S. Air Force and German Air Force pilots. Since he was a test pilot, I suppose it goes without saying that he owned a Porche and drove it too fast (or as his father called it, "flew too low"). By the time he was thirty, Major Lawrence had earned a PhD in Physical Chemistry at Ohio State. When he was thirty-one, he was selected as an Air Force astronaut. He he died two months after his thirty-second birthday. 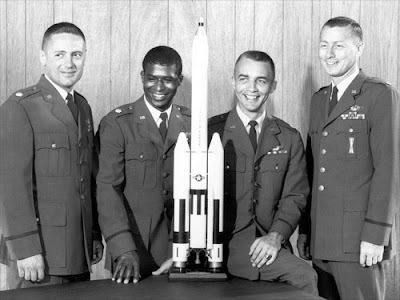 The 1967 class of Air Force Astronauts. The three who lived became Vice Chair of the Joint Chiefs of Staff; a NASA astronaut; and a General. Major Lawrence left behind a wife, Barbara Cress Lawrence, and young son. In 2007, his widow spoke about the prejudice Lawrence encountered as the first African-American astronaut during a StoryCorps interview. The interview is available here. Since they didn't fly on NASA missions, Majors Lawrence and Adams have been largely forgotten by history. Eight deceased astronauts and six deceased cosmonauts were memorialized in a plaque the Apollo 15 astronauts left on the moon in 1971, but Adams and Lawrence, the only two deceased Air Force astronauts, were not named on the plaque. 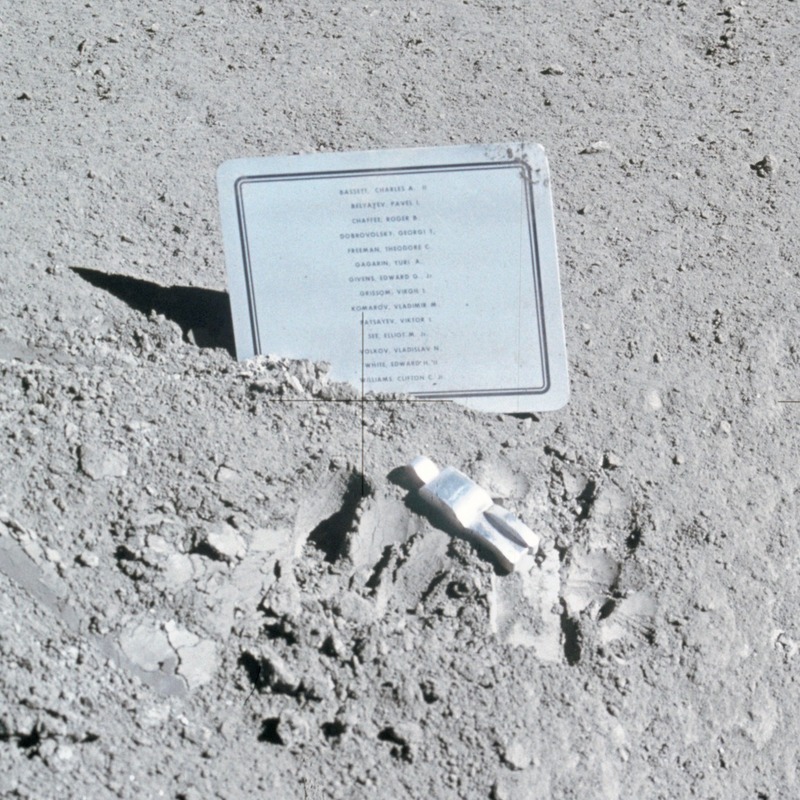 The Fallen Astronaut memorial at Hadley Rille. Major Adams was honored on the Astronaut Memorial at Cape Canaveral when it opened in 1991. Major Lawrence was not. The questionable bureaucratic reasoning for this omission was that unlike Adams, Lawrence had not been awarded Air Force astronaut wings. Mrs. Lawrence fought hard to have her husband awarded Air Force astronaut wings and added to the Astronaut Memorial. She finally succeeded in 1997. 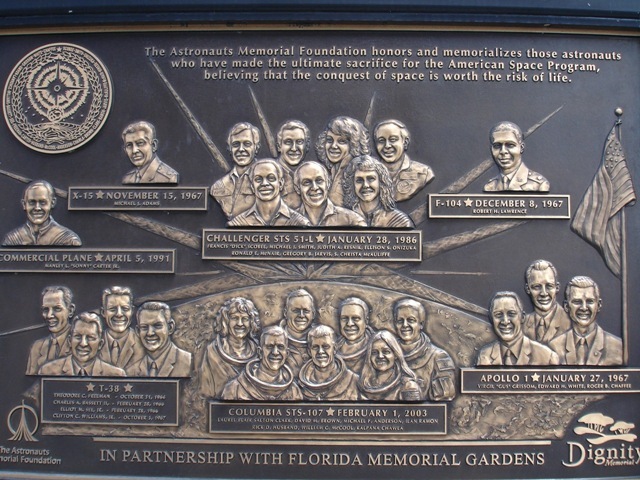 The Astronaut Memorial at Cape Canaveral; Majors Adams and Lawrence are at the top left and right. Source: MSNBC; NASA; Lodi News-Sentinel; Wikipedia; Vintage Space; Ebony (February 1968 and February 1984); StoryCorps; Encyclopedia.com; The X Hunters; CollectSpace.